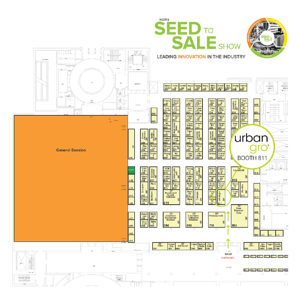 Lafayette, Colo., (February 11, 2019) – urban-gro, Inc., a leading agricultural solution and technology company that works with leading commercial cannabis cultivators around the world, will be hosting three design workspaces at the 2019 NCIA Seed to Sale Show to be held at the Hynes Convention Center in Boston, Massachusetts on February 12 and 13. These high-performance cultivation systems design workspaces will allow commercial cultivators to explore the design and technical considerations of numerous key cultivation facility systems—including irrigation, fertigation, climate control, benches, air movement, lighting, and pest management. These private workspaces will offer urban-gro’s customers the opportunity for detailed design and system evaluations to ensure optimal space utilization and product performance. Additionally, urban-gro will showcase Fluence Bioengineering’s LED lighting solutions, following their recent announcement as the company’s first horticulture system integrator in the Americas. The industry-leading SPYDR and VYPR lights will be on display, demonstrating the latest in cultivation lighting technology to improve crop quality, consistency, and operational efficiencies. urban-gro experts will be on hand in Booth #811 to meet with cultivators and answer questions regarding urban-gro’s systems integration solutions, products, and technology. urban-gro is a leading systems integrator and agriculture technology firm focused on serving commercial cultivators around the world. The company’s ag tech division, Soleil Technologies, delivers data-driven micro climate intelligence using high-density sense and control technology to improve crop quality, consistency, and operational efficacies. urban-gro helps cultivators achieve sustainable scalability via innovative solutions that drive down costs, increase economic yield and reduce environmental impact. By combining its design and integration services, industry-leading suite of cultivation equipment and crop management products, and proprietary technology solutions, urban-gro provides integrated solutions for today’s commercial cannabis cultivators to efficiently manage and optimize their cultivation operations. urban-gro is recognized as one of the cannabis industry’s fastest growing systems integration and agricultural technology companies. Visit urban-gro.com and soleiltech.ag to learn more. Follow us on Instagram, Facebook, Twitter and LinkedIn. This press release may contain forward looking statements which are based on current expectations, forecasts, and assumptions that involve risks and uncertainties that could cause actual outcomes and results to differ materially from those anticipated or expected, including statements related to the amount and timing of expected revenues and any payment of dividends related to our financial performance, expected income, distributions, and future growth for upcoming quarterly and annual periods. These risks and uncertainties are further defined in filings and reports by us with the U.S. Securities and Exchange Commission (SEC). Actual results and the timing of certain events could differ materially from those projected in or contemplated by the forward-looking statements due to a number of factors detailed from time to time in our filings with the Securities and Exchange Commission. Among other matters, we not be able to sustain growth or achieve profitability based upon many factors including, but not limited to, general market conditions. Reference is hereby made to cautionary statements set forth in our most recent SEC filings. We have incurred and will continue to incur significant expenses in our expansion of our existing and new service lines, noting there is no assurance that we will generate enough revenues to offset those costs in both the near and long term. Additional service offerings may expose us to additional legal and regulatory costs and unknown exposure(s) based upon the various geopolitical locations where we will be providing services, the impact of which cannot be predicted at this time.